"Every time I set my drums up on stage I sneak out the front to have a peek at how HOT the black sparkle looks under the lights!" Grrr Yamaha!" 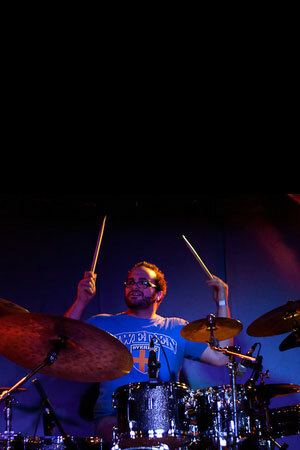 Mikey has been avidly playing the drums for the last thirteen years, and started his teaching career whilst he was still in high school. He currently teaches over 50 students every week, both privately from his personal studio and at Hillcrest and Emmanuel Colleges on the Gold Coast. Mikey has had the privilege of working alongside some amazing drummers such as Danny Glass (The Royal Crown Revue), Dean Butterworth (Ben Harper, Good Charlotte) and Jeff Bowders. He has toured Australia with Champions of the World, a nationally acclaimed Queen Tribute show, and internationally with Australia's longest running ABBA show. He has played with a diverse range of artists and bands such as Melanie George (UK), Rebecca St James (US), Matthew McGee (Gold Coast), Stevie Paige (Melbourne), Isaac Paddon (Gold Coast) and The Black Neon Shadows. He has also played in the Musical Isn't It Romantic. Mikey has the ability to capture an audience with his high energy performances and infectious grooves, odd time signatures, tasty fills and monstrously fast and powerful single kick. Mikey is quickly becoming one of Australia's most exciting emerging young drummers.